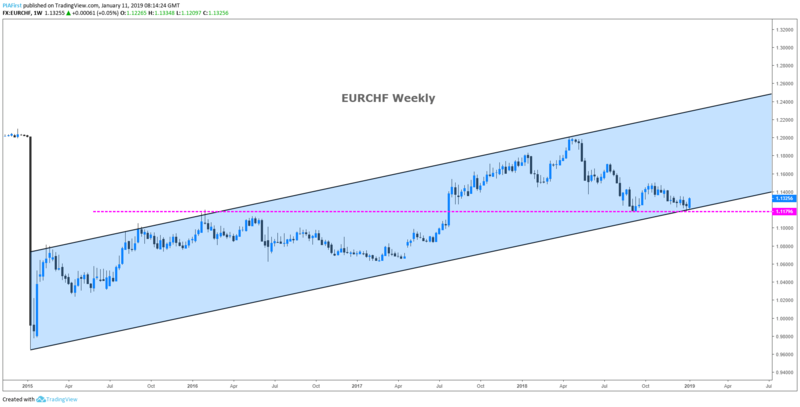 Weekly: EURCHF has found support at the lower end of a bullish channel on the weekly chart. This also coincides with major support at 1.1180. If EURCHF closes above its current level on Friday (11/01/2019) then a bullish engulfing candle will have formed on the weekly chart. Daily: Broken out of the channel formation to the upside. In line with support, buying has been posted from 1.1183. Yesterday's Marabuzo is located at 1.1282. Further upside is expected. Intraday: The continuation higher in prices through resistance has been impressive with strong momentum and shows no signs of slowing. Positive overnight flows lead to an expectation of a firm open this morning. We look for a re-test of the downward trending support. Further upside is expected although we prefer to set longs at our bespoke support levels at 1.1305, resulting in improved risk/reward.